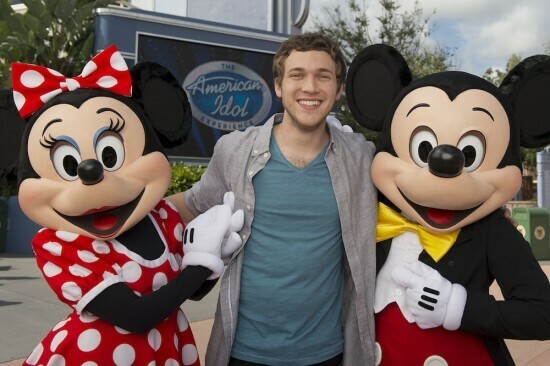 Keeping the tradition of recent “American Idol” winners, season 11 champion Phillip Phillips yesterday visited Walt Disney World, surprising theme park guests when he made an appearance on-stage at “The American Idol Experience” at Disney’s Hollywood Studios. Though Phillips couldn’t make it to Orlando immediately following his victory on the show in May, he finally arrived in central Florida this week for a performance in the “American Idol Live!” concert tour, which continues through mid-September 2012. Though he didn’t sing while in the park, Phillips did take the time to pose with Minnie Mouse and Mickey Mouse and taped a series of short videos that Walt Disney Entertainment plans to utilize in the future during the attraction experience. Every “American Idol” winner has appeared at Disney’s attraction since it opened a few years ago, including most recent winners Scotty McCreery and Lee DeWyze.